Quick! Who do you think is more likely to be happy and healthy at the age of 90, all things being equal? A woman who moves several states away to live near her children and grandchildren? Or a woman who remains in the same town where she’s lived for decades, only seeing her children and their families on holidays? The answer may surprise you. While most people believe that “family comes first” and that being near our blood is more important as we age, research is showing that it may be friendship, not family, that makes us the most happy as we age. According to a nine-year study done by Northwestern University, there’s a strong link between brain health and fulfilling, positive relationships as we age. The study looked at 31 “SuperAgers,” defined as women and men over the age of 80 who have exceptional memories. Every few years, the group filled out surveys and received a variety of neuropsychological tests and other evaluations. These tests showed that SuperAgers have distinctive brain features: a larger left anterior cingulate (a section of the brain that’s important to working memory and attention), a resistance to age-related atrophy and thicker brain cortexes. But the surveys filled out by the SuperAgers showed, perhaps, the most important difference between them and their “normal” peers: overall, the SuperAgers reported more warm, satisfying and trusting relationships that provided them a purpose in life. So what defines a meaningful relationship? While the aforementioned study showcased friendships over family, it’s important to remember that familial relationships play an important role in our happiness and shouldn’t be neglected. William Chopik, an assistant psychology professor at Michigan State University, recently published a review about friendships, family relationships and the benefits and stressors of both. The importance of family is a factor throughout our life, especially our bonds to spouses and children. The importance of these relationship remain pretty much the same throughout our entire lives, neither lessening or increasing as we age. Non-family friendships, however, grow in importance as we age, especially over our middle and senior years. These results came from information gathered from 270,000 adults of all age ranges who answered relationship questions, as well as a survey focusing on the strain and support of social relationships among 7,400 individuals aged 65 and older. “You can’t choose your family, but you can choose your friends,” as the old saying goes. Although making and maintaining friendships is more difficult as we age, it’s not impossible. In fact, it may be easier once we reach a certain stage of our lives. For example, empty nesters and retirees may more easily be able to develop meaningful relationships because they have more time and fewer responsibilities. 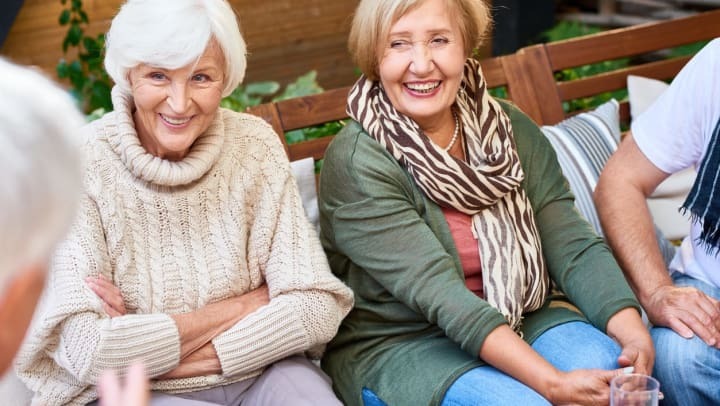 Older adults who decide to move into a senior living community like Azpira Place® of Lake Zurich often find themselves developing deep friendships because they’re with other like-minded individuals in the same stage of life (who are also looking for relationships and friendships). Now, it’s true that as we get older, it’s harder to make and maintain friendships. However, it’s not impossible, especially if you dedicate yourself to making it happen. Here are a few ways to find friends and keep them, no matter how old you may be. One of the easiest (or at the very least, the most logical) ways to find fulfilling relationships is by going through our existing lists of friends. Do you have acquaintances you’d like to know better? Friends with whom you were close once, but have drifted apart due to life circumstances? Is there an old classmate who’s recently moved to your city? Go through your address book or Facebook list and reach out with an invite to coffee, dinner or an activity. Do you have a hobby you’d like to become more involved in? Want to try a specialized exercise class? Or maybe you’ve always wanted to start a club and share your knowledge? By trying out something new, you’ll become exposed to other people who have similar interests to you, which is always a good foundation to start building a friendship. You may also find a new passion to spend your time on! It can be hard to reach out and ask someone to spend time with us. Just be bold! The worst anyone can say is “no,” and chances are, there’s someone who’s been wanting to spend more time with you but just hasn’t had the courage to speak up. Building a deep friendship takes time, and so it’s important to make time for it. Setting up a weekly coffee date takes a small bit of planning up front, but once it’s on the calendar, you’re set! Look for opportunities in your life where you can squeeze in social time, and you’ll quickly discover that making time becomes second nature. Moving to a senior living community like Azpira Place® of Lake Zurich can be a huge boon to your social life and your friendships. By choosing to live in a place where you’re with a large community of people in the same stage of life, you’ll find that you’ll have the time and the opportunity to make friendships happen. It’s a little like going back to college, without having to worry about studying and making the grade! We’ve seen firsthand how our residents are making deep friendships each and every day, and we’d love for you to have the opportunity for yourself. To learn more about how friendships can brighten your senior years, contact the team at Azpira Place of Lake Zurich. We would be happy to help you or a loved one see how senior living can enhance your life while improving your health. Call us today to schedule a tour at 847-438-6100. Azpira Place® of Lake Zurich in Lake Zurich, IL, offers engaging Supportive and Assisted Living that inspires residents to Live Well. Age Well. Be Well. Every day. Here, you will find the perfect balance of support along with an inspiring lifestyle. After all, while residents may need assistance with daily activities, they don’t want to give up any opportunities to be active, involved and engaged within their community. Residents have their choice of a variety of spacious apartment floor plans, allowing for the privacy they desire with multiple opportunities for activity right outside their door. Best yet, our engaging programming, 24-hour access to care, bountiful services and exciting amenities are all within their reach. Enjoy our culinary experience in The Ela Restaurant, the Outdoor Terrace Café or Prairie Grass Bistro. Spend time in our Hawthorn Movie Theatre or Oakwood Learning and Technology Center, relax in the Sundara Spa and Salon or take your beloved pet for a walk in our outdoor gardens. The choices are all yours. Azpira Place® of Lake Zurich was designed to give seniors the tools to live the fulfilling lifestyle they desire. Here, residents never have to worry about housekeeping or maintenance, and they always have peace of mind knowing care is available whenever it’s needed. That leaves time for enjoying the things that they want to do. With VIVA! programming by Pathway to Living®, residents can live their days how they choose, whether they want to be active or simply relax. Take advantage of an array of health and wellness programming, learn something new, share a talent or skill with others within the community or relax in your private apartment. No matter what, there’s no shortage of ways to live well, age well and be well. Learn more today by calling us at 847-438-6100.